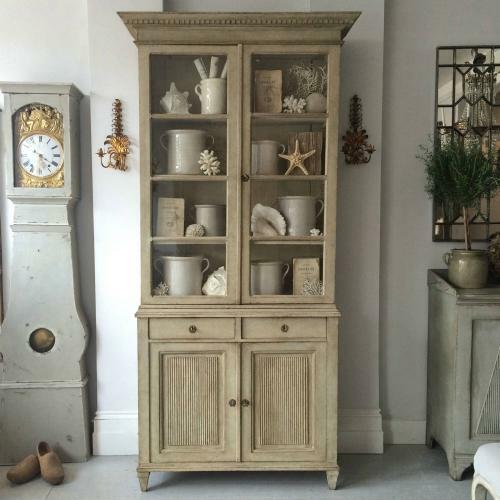 A very fine and wonderfully elegant Gustavian style vitrine display cabinet or bookcase standing almost eight feet in height. The upper cabinet features a decoratively carved overhanging pediment cornice with dentil trim, over two tall glazed doors with their original 'wobbly' glass. The lower cabinet features two useful drawers over a pair of inset panelled doors with carved vertical reeding, and square tapered feet. This majestic piece of 19th century Swedish furniture would look stunning in a reception room filled with decorative items and books, or perhaps make an even greater statement as a beautiful dresser in a kitchen dining room filled with white crockery.